Discuss what the tools of modern neuroscience have revealed about the brains of people who spent years cultivating well-being and qualities of mind that promote a positive outlook. Utilize the tools of modern neuroscience along with the wisdom of Buddhism to study kindness and compassion--how spirituality meets science through the new field of contemplative neuroscience. 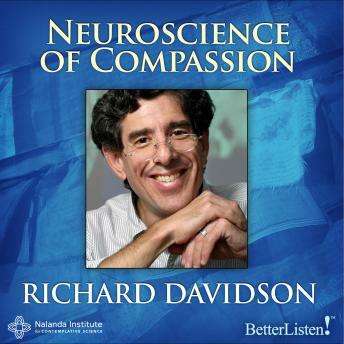 In 1992, the neuroscientist Richard Davidson got a challenge from the Dalai Lama. By that point, he'd spent his career asking why people respond to, in his words, "life's slings and arrows" in different ways. Why are some people more resilient than others in the face of tragedy? And is resilience something you can gain through practice? The Dalai Lama had a different question for Davidson when he visited the Tibetan Buddhist spiritual leader at his residence in Dharamsala, India. "He said: 'You've been using the tools of modern neuroscience to study depression, and anxiety, and fear. Why can't you use those same tools to study kindness and compassion?' ... I did not have a very good answer. I said it was hard." The Dalai Lama was interested in what the tools of modern neuroscience could reveal about the brains of people who spent years, in Davidson's words, "cultivating well-being ... cultivating qualities of the mind which promote a positive outlook." The result was that, not long afterward, Davidson brought a series of Buddhist monks into his lab and strapped electrodes to their heads or treated them to a few hours in an MRI machine. "The best way to activate positive-emotion circuits in the brain is through generosity," Davidson, who founded the Center for Investigating Healthy Minds at University of Wisconsin, Madison, said in a talk at the Aspen Ideas Festival. "This is really a kind of exciting neuroscientific finding because there are pearls of wisdom in the contemplative tradition-the Dalai Lama frequently talks about this-that the best way for us to be happy is to be generous to others. And in fact the scientific evidence is in many ways bearing this out, and showing that there are systematic changes in the brain that are associated with acts of generosity."